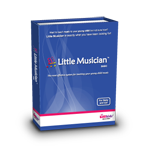 A basic set which includes the Little Musician software, content and two booklets, Little Musician Basic will help get parents started on teaching their young children to read. Lesson content is different every day, and even the same day's lesson play back differently each time! This is made possible by randomization and rotation features in the software that pull from the vast media resources (different pictures, audio and video) in Little Musician. Listen, sing, move, clap and play while learning.